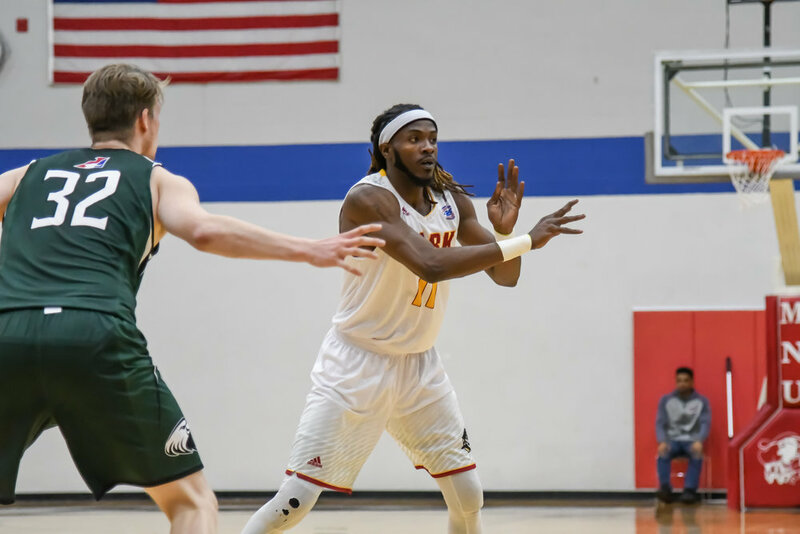 Park University will present a screening of “Hopes, Dreams and Basketball – Joseph’s Story,” a 21-minute documentary about Park student-athlete Joseph Mebaley, on Friday, Feb. 15, at 5:30 p.m. in the Jenkin and Barbara David Theater inside Alumni Hall on the University’s Parkville Campus. Admission is free. The “no-budget” documentary highlights the challenges Mebaley faced while adapting to life in the U.S. and his dreams of playing professional basketball. The film was produced by Jason Samayoa and Ariana Elliott when Mebaley was a student at Metropolitan Community College – Penn Valley in Kansas City, Mo. Samayoa, a Title IV specialist at Park, previously worked at MCC-PV as a financial aid adviser. Park basketball player Joseph Mebaley will be featured in a 21-minute documentary that will be played on Feb. 15 at 5:30 p.m. on the Parkville campus. Samayoa got to know Mebaley, a basketball player from Gabon, a country along the Atlantic Ocean coast of central Africa, as he struggled financially. Samayoa said he was inspired by Mebaley’s work ethic and his positive attitude during a challenging time in his life. Mebaley, who earned an Associate of Arts degree from MCC-PV and was a member of the Wolves basketball team, is now a junior majoring in business administration/finance at Park and is a member of the Pirates basketball team. The 25-year-old came to the U.S. in 2013 when he was told that he should train for a potential NBA career after being named most valuable player on Gabon’s national team. Immediately following the documentary, Mebaley, Samayoa and Elliott will conduct and question-and-answer session. The documentary can be viewed at youtube.com/watch?v=9xnJ05mfDyU.